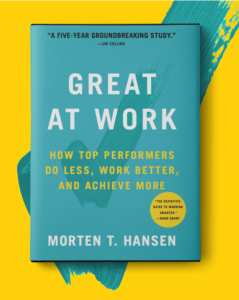 Professor Morten Hansen joins Deidre and JG to share the results of his research on working smarter, not harder. Professor Morten Hansen, U.C. Berkeley professor and author of Great at Work, was with us this week to discuss his 7 principles that will help you do less, work better, achieve more, and become a top performer. Listen to the episode for more of Professor Hansen’s “wiZdoms” and check out his website www.Mortenhansen.com to take his quiz to find out where you stand in his research! Do less, then obsess. Instead of over-whelming yourself with too much work, concentrate on a few things and go all in on those tasks. Then, give those tasks your undivided attention. Redesign your work. Be innovative when it comes to the way you do your work. Once you have fewer tasks to give 100% to, you can find a better way of getting the work done. Don’t just learn, loop. Continue to develop and work on being better than you were the day before. Practice does not make perfect, perfect practice makes perfect! Passion and purpose. There needs to be a combination of both passion and purpose. Passion alone won’t make you a top performer, you need to also have a contribution mindset. Forceful champions. Not only do you need to learn to advocate for your ideas, but you also need to be able to overcome any obstacles in the way and persuade people to support you. Over-collaborating. There is such a thing as too much collaboration! Spending too much time collaborating is a waste of time and a distraction from focus. LISTENERS: How will you start to focus? Share your experiences and “wiZdoms” with us! Either leave us a voicemail at 1-646-653-9278 or send us an email. We may talk about it - or we may even talk with YOU - on the air!